Consequently a new effort was initiated at Joe Budd Aquatic Education Center (now Joe Budd Youth Conservation Center) outside of Tallahassee. It involved engaging 9- to 15-year-old students in weeklong day camps. After evaluation by an outside researcher, it was determined that 71 percent of campers fished more after attending camp than they had before. Additionally campers rated all aquatic concern statements as significantly more important than did the comparison group. Ken Haddad, then-FWC executive director, encouraged staff to address these concerns. As a result, FWC supported formation of the Get Outdoors Florida! coalition (www.GetOutdoorsFlorida.org). Besides FWC, Florida Big Brothers and Big Sisters, Florida’s departments of Environmental Protection (State Parks), Agriculture and Consumer Services (Forestry Divisions) and Education and Health all joined. In addition, the U.S. Fish and Wildlife Service and U.S. Forest Service joined along with numerous university, private and non-profit sector partners. Get Outdoors Florida prompted the Governor and Cabinet to pass the Florida Children’s Outdoor Bill of Rights. Shortly thereafter the FYCCN (www.FYCCN.org) and Get Outdoors Florida partners began working together to create the “Next Generation that Cares” and to “Engage communities, families and individuals in outdoor experiences to achieve healthier lifestyles and sustain Florida’s natural resources.” To take it to the next level the FYCCN has since established a network of camps around the state. Camps typically include fishing, boating, shooting sports and wildlife discovery. Although camps vary in specific activities, conservation-­centered recreation is a consistent theme. Some of these camps, like Ocala Outdoor Adventure Camp and Everglades Youth Conservation Camp, have been offering fun, affordable and educational camps for decades. Caring staff and volunteers make every effort to help the campers have a safe, enjoyable experience in the real Florida. If you know a youth that would like to participate, check out the FYCCN.org website. There are many opportunities for a fun and fullfilling camp experience. Moreover you’ll be helping them to establish a lifetime interest in outdoor recreation that could extend the quality of their life and help ensure the future of our fish and wildlife resources. If you have a program that can help get children outdoors and would like to publicize the program or event, join us at GetOutdoorsFlorida.org. CPatchen: Charles Patchen was invited fishing by his mom and stepfather on a Sunday morning, not sure he wanted to go, he ended up being delighted. 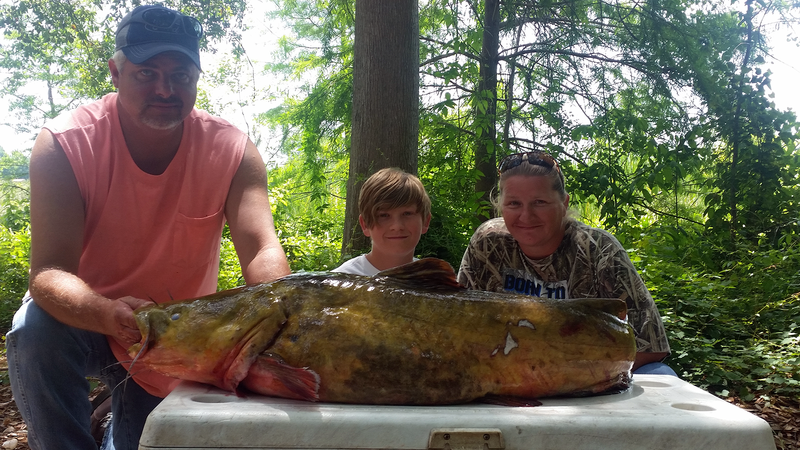 This is them with Charles’ 63.8-pound state-record flathead catfish, caught on May 15, 2016 (www.myfwc.com/fishing/freshwater/fishing-tips/record/). Ishmael: After being introduced at age 12 to fishing by a neighbor and mentor, Ivan Sauls, Ishmael Lacoste went on a fishing bender in the Jacksonville area culminating in earning his Elite Angler Certificate in just nine months from the Big Catch program (www.BigCatchFlorida.com). 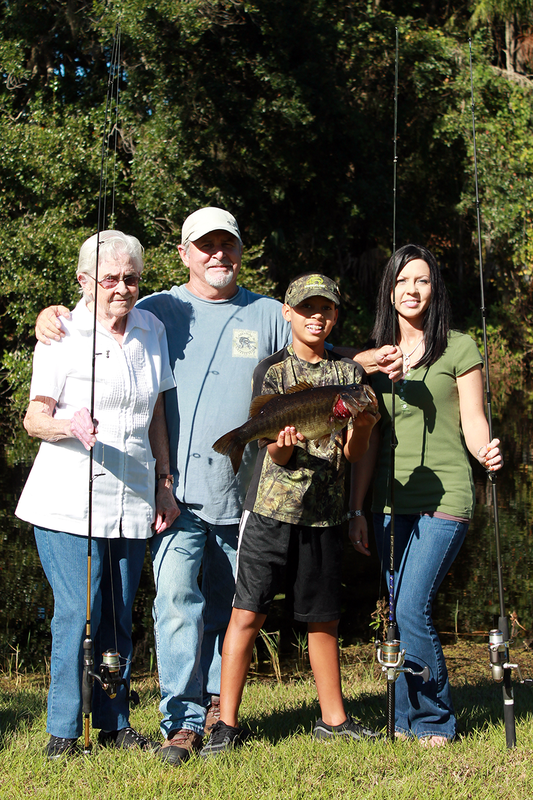 LunkerLouie: “Lunker Louie” is from a family of fishing enthusiasts. He is a Hall of Fame angler in the TrophyCatch program (www.TrophyCatchFlorida.com) and well known spokesman for Highlands County Fishing.